I'm all about making lemonade when life gives you lemons! But what do you do when your husband brings home a five-pound bag of lemons? I'm a huge fan of lemon desserts, and I found this recipe for Lemon Shortbread Cookies at Food.com and decided to give it a try. I changed it up a bit to make it my own, and the results are amazing! These lemon cookies taste like lemon, they're buttery and crumbly and are absolutely perfect for dunking! Affiliate links are added for your convenience. My full disclosure policy is available here. The original recipe calls for 2 tsp of fresh lemon juice and an unspecified amount of lemon zest. 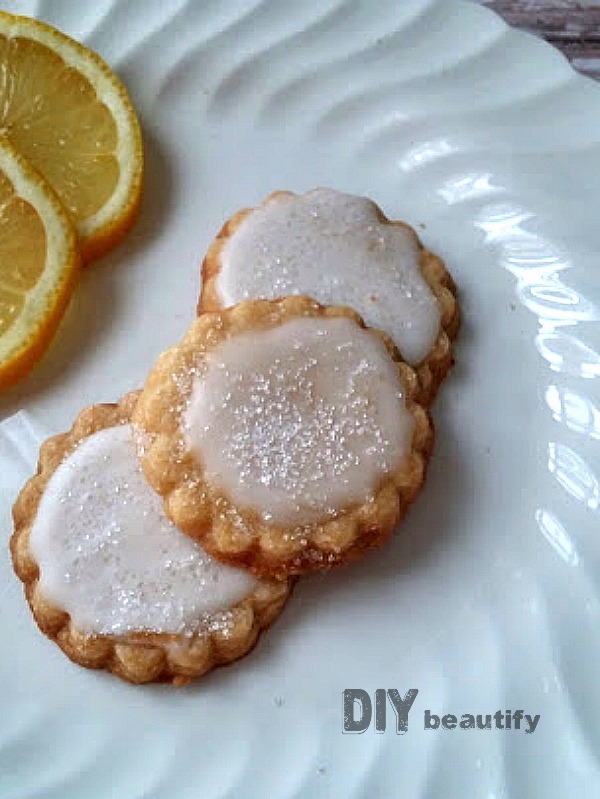 Here's what I did to make my cookies extra lemony...after all, there's nothing worse than biting into a lemon-flavored treat and wondering what happened to the lemon! I washed a large lemon, dried it and popped it in my microwave for 15 seconds. Next, I rolled in on the counter (we're all about releasing all the juice inside!). Then I zested the whole lemon before slicing it in half and reaming all the juice out. I strained the pulp and seeds so I was left with pure lemon juice. I used 3 Tbsp of lemon juice in my cookie batter, as well as all of the zest. The rest of the juice went into the glaze, see below. I lightly sprinkled powdered sugar on my counter and rolled my dough out in small sections and used a small scalloped biscuit cutter* to cut them out into circles. They bake at 325° for 15-20 minutes. While they cooled, I whipped up a delectable and simple Lemon Glaze. 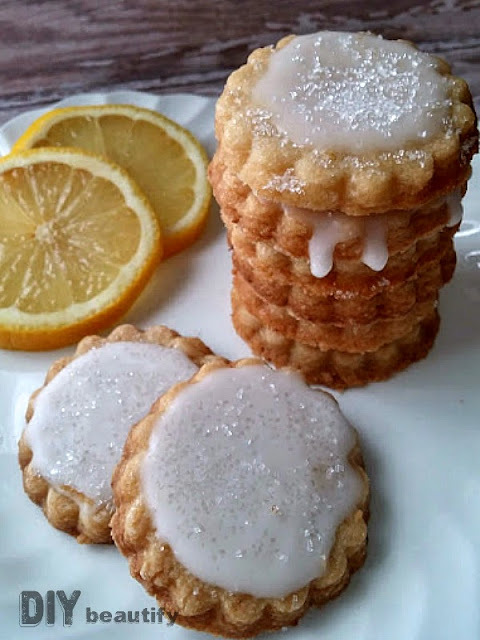 Mix 1-1/2 cups powdered sugar with 3-4 teaspoons of leftover lemon juice to make glaze. If it's too runny, add a little more powdered sugar; too dry, add a bit more lemon juice. Once cookies have cooled, pour glaze over the top; sprinkle with sanding sugar*. If you have kids, make sure you set a few aside for yourself...these lemon shortbread cookies didn't last long in my home! Everyone loved them. 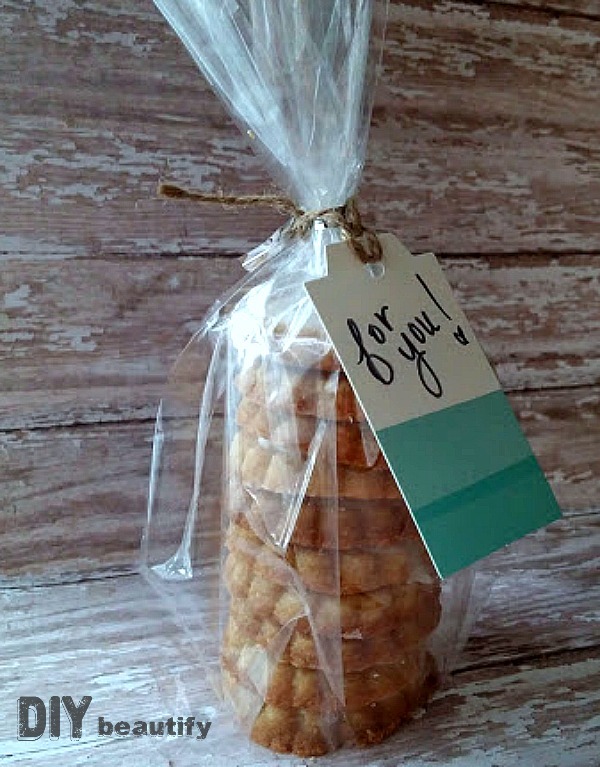 The sanding sugar is optional, but it adds a pretty sparkle and a nice crunch to the cookies. A cup of Earl Grey and these lemon shortbread cookies makes quite a nice snack! Just in case you were wondering, I did make lemonade too...blueberry lemonade! 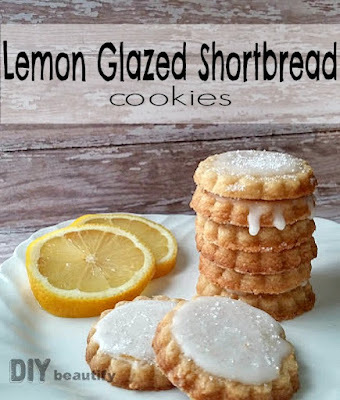 Nice lemon recipe, I like lemon tarts, yummy, these lemon cookies with glaze look good too. I LOVE lemon cookies - they always taste so fresh and refreshing!!! Thank you for an easy recipe!! !